The Eee PC™ 1008P is encased from top to bottom in visually striking, organic Digi-Waves. The rippling lines—which convey a sense of forward movement—adhere perfectly to the golden ratio, bearing testament to the extreme precision required to produce the subtle waves and retain color consistency across the peaks and troughs. The perfection of each wave can be perceived with the gentlest of touches. Hot Pink is the new black for fashion and a shock of punchy pink is just the thing to brighten any ensemble. This positive and very orgulous color clearly communicates the idea of immateriality, entropy and energy of a strong optimistic presence. The Hot Pink Eee PC™ 1008P which recalls a fashionable woman strolling down New York's Fifth Avenue—has a metallic silver bottom layer and a transparent Hot Pink IMR upper layer. Every Eee PC™ 1008P bears Karim Rashid's signature, marking its status as a beacon of style that will make waves wherever you tote it. Subtle, mature and understated yet elegant, Coffee Brown is timeless and classic—bringing to mind a gentleman sipping coffee at the Café de la Seine, enjoying a relaxing afternoon by reading John Wooden's poetry. The Coffee Brown Eee PC™ 1008P has two layers: a Coffee Brown bottom layer sprinkled with gold glitter, and a soft-to-the touch upper layer of translucent rubber paint. The Eee PC™ 1008P offers near-instant access to the Internet thanks to the inclusion of Express Gate, an ancillary operating system that boots up in seconds. Make Skype calls, surf the web, browse photos, play online games, engage in instant messaging, and much more with Express Gate! The Eee PC™ Seashell Karim Rashid Collection reflects Karim and ASUS' view that function, material, form, performance, texture, color and ease-of-use are inseparable in any object of beauty. It is designed to stimulate all five human senses, including the sense of touch, which is often overlooked in the PC domain. The Eee PC™ Seashell Karim Rashid Collection thus sets itself apart from other netbooks through its innovative finishes that pamper users' palms and fingertips. The Eee PC™ Seashell Karim Rashid Collection features a breathtaking design that includes a 10.1” frameless LED backlit display and an ergonomic chiclet keyboard. 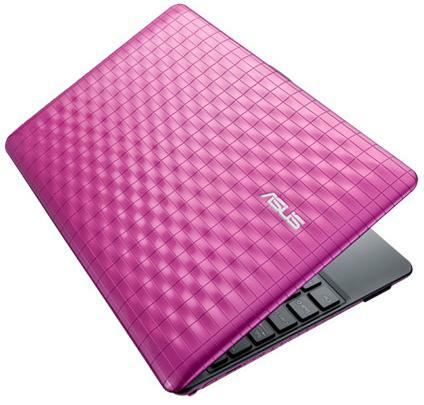 It also comes with an extra 500GB of online ASUS WebStorage which allows users to access, share and back up their files and media no matter where they are, through an easy-to-use drag-and-drop web-based interface. The Eee PC™ 1008P's beauty is matched only by its energy efficiency. It features the new power-saving Intel® Atom™ N450 CPU, which works in tandem with ASUS' exclusive Super Hybrid Engine energy management technology to deliver 6 hours of battery life on a single charge. A replaceable battery design and memory door ensure that changing the battery or upgrading parts are simple affairs. In addition, the slim and eco-friendly Li-polymer battery can be charged more than one thousand times, which is three times more than normal batteries. The Eee PC™ 1008P's is truly the product of ASUS' love for the Earth.